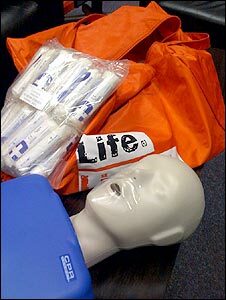 First aid should be a compulsory part of the school curriculum, St John Ambulance has urged ministers. The charity carried out a survey of more than 1,500 school children, of whom seven out of 10 said they would not know how to help in an emergency. First aid is a mandatory subject for Welsh and Northern Irish pupils, but in English and Scottish schools it is an optional part of the curriculum. The government said that it intends to bring England into line by 2011. An estimated 400,000 young people are injured each year at school, according to the first aid charity. More than 300,000 children have been taught first aid skills since the St John Ambulance training resource pack scheme was launched in 2007. Its survey, which was carried out in association with the Children's Forum, suggested that the same proportion of primary and secondary children who said they would not know how to help someone in need of first aid would like to learn. The findings suggest 69% of school pupils would not know how to help someone who needed them if they were injured. And some 72% of respondents said they would like to learn first aid. The British Red Cross also argues that all schools should teach first aid, because the UK lags behind the rest of Europe when it comes to life-saving skills. According to the charity, some 80% of people in Scandinavian countries and Germany have first aid skills, compared with 7% in the UK. It says first aid can save lives in a number of situations. 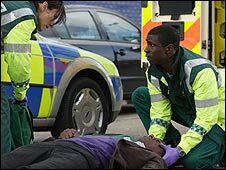 For example, immediate CPR treatment is thought to double or triple the chances of survival for heart attack casualties. The British Red Cross also estimates that of the 5.5 million people who visit A&E departments for accidents each year, about 3 million suffer from injuries that would benefit from some form of first aid treatment. Elaine Howlings, who co-ordinates school training for St John Ambulance, said the "overwhelming message" from the survey was that the children surveyed were "scared by the fact that they would not know what to do" in an emergency. She said: "They wanted to be able to help - helping their friends when they fell off walls or swings, to seeing people that had been involved in car accidents, and one poor lad had actually witnessed a stabbing which was quite awful."